Do you believe in Go(l)d or America? 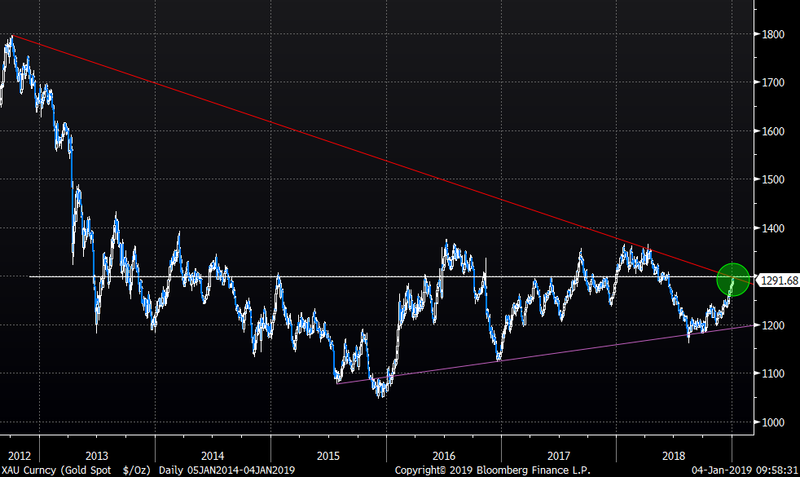 We have been arguing for the strategic long gold logic since early autumn 2018. 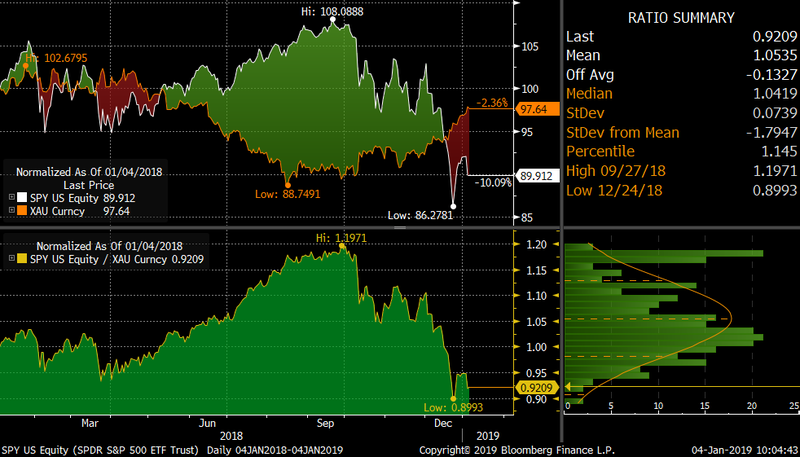 Our base case has been that global markets were about to experience a surge in volatility as well as the fact extreme positioning in pretty much every asset would revert and kill the crowds. In early October we asked ourselves rhetorically “Could VIX be a Cheap Global Hedge”? 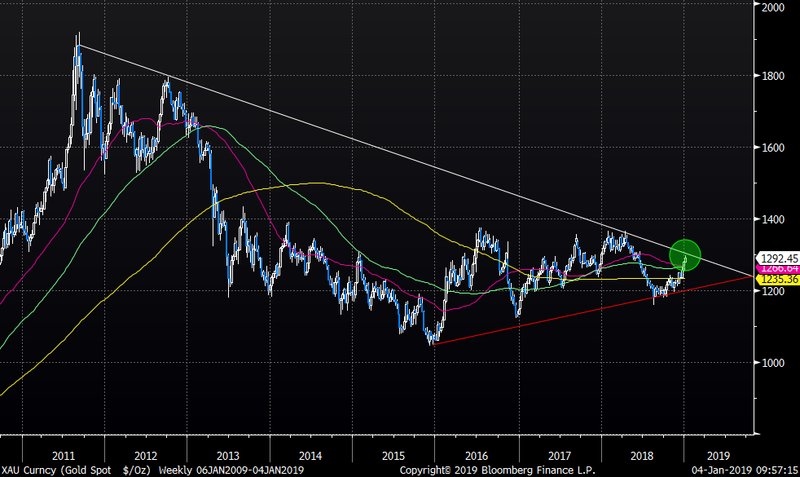 We mentioned the gold space being another crowded trade where we have seen “smart” money short the shiny metal for a long time. 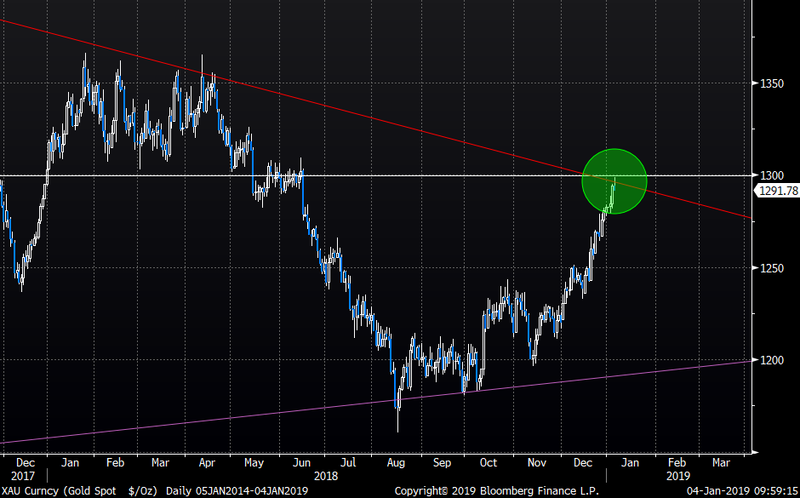 The trade has worked until we saw that massive day higher some 2 weeks ago…. Today we are seeing gold take another leg higher, currently above the 100-day average. Key for this move to continue higher is a close above the 1230 resistance level. Erratic and volatile markets have continued but whenever an asset has reached our short-term expectations, we like to revisit our logic. Gold practically visited the mighty 1300 level overnight we have been expecting since early autumn. What´s next? 1300 is a huge level to respect on the daily chart dating back to 2012. Note the negative trend line right around these levels. The shiny metal is up almost 10% in a straight line. We would be happy to take chips off the table here. The weekly chart from the 2011 highs has a big negative trend line here. We would be rather humble than greedy here. 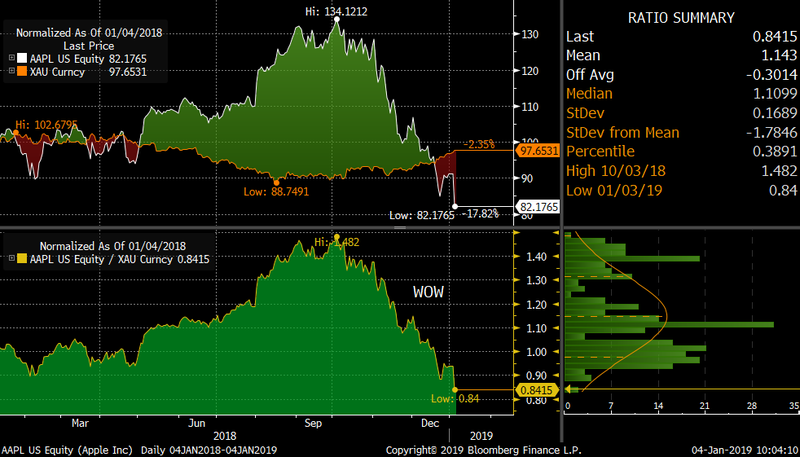 Part of the gold long logic was based on the fact the (smart) crowd had amassed big short exposure in gold, leading a to an extreme low reading in September 2018 (white). Note how gold bottomed out as max shorts continued to short gold. 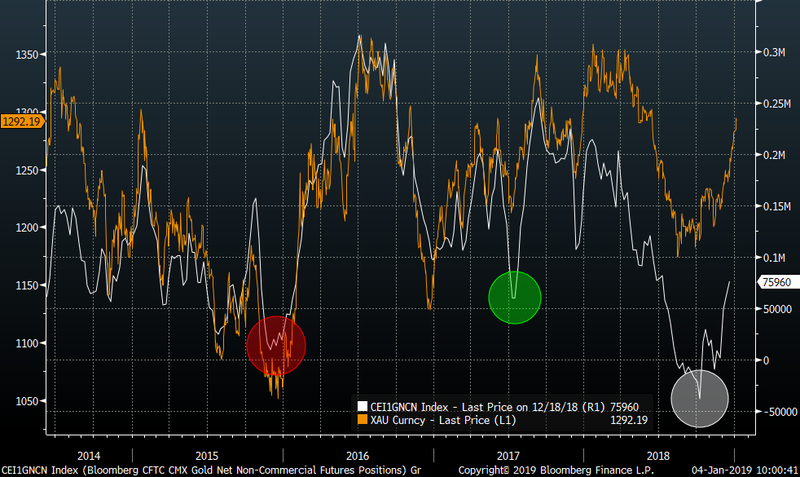 Since then net non-commercial gold shorts have turned around and covered. Positioning is not longer nor short nor extreme. Time to move on for us. The “most” fundamental reason for gold longs is the inflation component. If anything, expectations for inflation have plummeted, if you look at the Fed´s most preferred chart, the 5-year breakeven inflation rate (white). 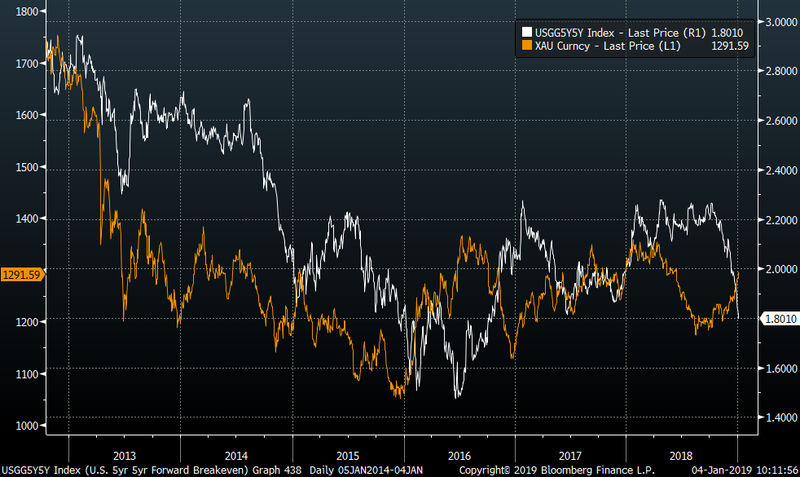 The chart shows rather clearly that gold (orange) does not tend to go up with inflation expectations falling. The below chart shows the SPY US (white) versus gold (orange). The ratio has collapsed and is reaching far out on the normal distribution chart as well. Even more extreme is the “Buffet” trade. Apple (white) versus gold (orange) ratio has collapsed totally. It is so far out on the normal distribution curve, that it is starting to tickle our contrarian instinct here.